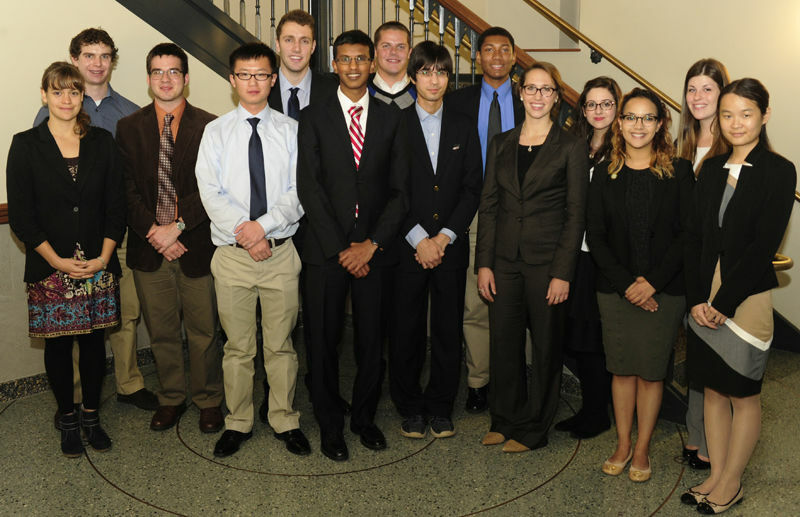 Left to right: Yoshiyuki Kondo (Toshiba), Todd Major (MicroLink Devices), Yuji Nakanishi (Murata Electronics), Chris Vander Tuuk (Olympus), Ethiyal Raj Wilson (3rd place – University of Nebraska), Dane Wheeler (HRL Laboratories), David Heydari (1st place – Northwestern University), Erik Probstfield (International Rectifier), Monica Ohnsorg (2nd place – Hope College), Ram Chelakara (Raytheon), Roxana Nicolaescu (Serim Research), and Arup Polley (Texas Instruments). level of work you are doing as undergraduates. It is very, very impressive." David Heydari’s project focused on creating powerful quantum cascade lasers with excellent beam quality using a simple processing method. Quantum cascade lasers are the only semiconductor sources that can emit at room temperature in the mid-IR regime, which makes them extremely useful for applications such as communications and stand-off spectroscopy. Originally published by Heidi Deethardt at nano.nd.edu on November 06, 2015.